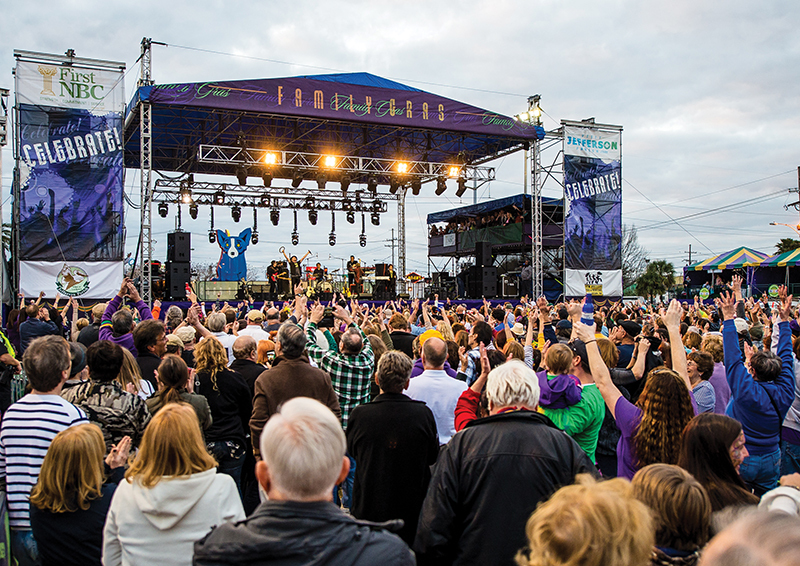 Metairie’s premier Mardi Gras celebration returns this year at a new location at Clearview Center. There will be music, food, beverages, and, of course, parades from Feb. 22-24. John Oates, Michael McDonald and Brett Eldredge are among the headliners this year. Information, VisitJeffersonParish.com. Have you ever wished you could travel back in time to watch a classic movie at an old-school movie palace? If so, you’re in luck because the Saenger Theater is showing the beloved 1939 film The Wizard of Oz on Feb. 12-13. Information, SaengerNOLA.com. Get an early start to your parade season this year with the Intergalactic Krewe of Chewbacchus on Feb. 9 in the Marigny. It is a marching parade full of dozens of sub-krewes, each with its own unique theme relating to sci-fi/fantasy/nerd culture (e.g. The Leijorettes, Krewe du Who, Krewe of the Living Dead). Information, Chewbacchus.org. Leave the kids at home for this raucous, irreverent, and R-rated musical from the creators of the hit TV show South Park. Playing from Feb. 5-10 at the Saenger Theater, The Book of Mormon tells the story of two hapless missionaries trying to spread the Mormon faith around the world. Information, SaengerNOLA. The Wolves, Southern Rep. Information, SouthernRep.com. Stockholm Syndrome, Little Gem Saloon. Information, NOLAProject.com. A Gentleman’s Guide to Love and Murder, Le Petit Theater. Information, LePetitTheatre.com. Shear Madness, Westwego Performing Arts Theater. Information, jpas.org. Mozart’s Abduction from the Seraglio, Mahalia Jackson Theater. Information, MahaliaJacksonTheater.com. The Boat Show, Mercedes Benz Superdome. Information, MBSuperdome.com. Dreamgirls, Jefferson Performing Arts Center. Information, jpas.org. Pod Save America, Orpheum Theater. Information, OrpheumNOLA.com. Tet Fest, Mary Queen of Vietnam Church. Information, MaryQueenVN.org. The Adventure Zone, Orpheum Theater. Information, OrpheumNOLA.com. Panic! At The Disco, Smoothie King Center. Information, SmoothieKingCenter.com. Iliza Shlesinger, The Joy Theater. Information, TheJoyTheater.com. New Orleans Rock ’n’ Roll Marathon, Mercedes Benz Superdome. Information, RunRockNRoll.com. My Brother, My Brother and Me, Orpheum Theater. Information, OrpheumNOLA.com. Glenn Miller Orchestra, Orpheum Theater. Information, OrpheumNOLA.com. Visions of Vienna and Salzburg, Orpheum Theater. Information, OrpheumNOLA.com. Krewe du Vieux, French Quarter. Information, KreweDuVieux.org. Dancing With the Stars Live: A Night to Remember, Saenger Theater. Information, SaengerNOLA.com. Blood Orange, The Joy Theater. Information, TheJoyTheater.com. Rainbow Kitten Surprise, The Joy Theater. Information, TheJoyTheater.com. Need to Breathe: Acoustic Live Tour, Saenger Theater. Information, SaengerNOLA.com.